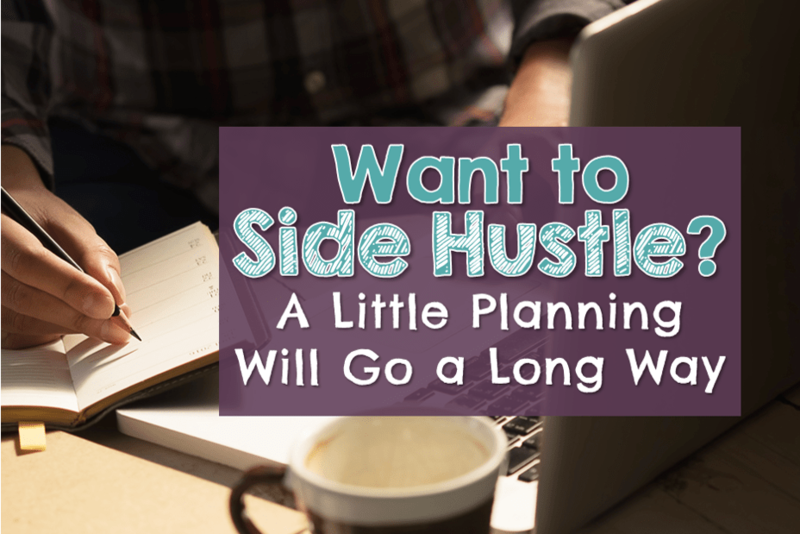 Want to Side Hustle? 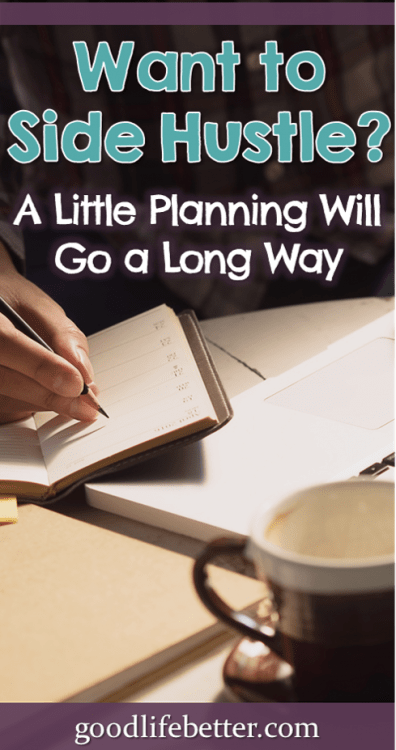 A Little Planning Will Go a Long Way | Good Life. Better. There are lots of reasons to launch a side hustle: you’re bored, you want to transition to a new field, you want to pay down debt faster or build your emergency fund, or even to increase the amount you are putting away for retirement. When I started my side hustle in November of 2015, I was motivated by near-term income but also by the idea that I was creating a small business I could continue into retirement. I know me—I like to stay busy and feel productive. My side hustle will allow me to stay engaged mentally and give me a reason to remain connected to other professionals. For those wanting to side hustle, the good news is that whatever your motivation, starting a side hustle is relatively simple these days. Depending on your business, technology may allow you to work from home or from a shared work space that doesn’t require you to sign a long-term lease. What’s more, your customers don’t have to live in your neighborhood (or even in the same hemisphere!). Simple doesn’t mean it will be easy, however, or that business planning isn’t worthwhile. A little time spent planning on the front end could really pay dividends down the road. Here are three questions to start with. Starting a side hustle is likely going to be a lot of work and—in the beginning at least—a lot of work without pay. Because of this, a clear understanding of what you want to accomplish and why you are willing to spend your nights and weekends working on it is really important. If you haven’t picked it up yet, Simon Sinek’s Start With Why is a helpful read although if you are short on time, watch his TED talks here. Both of these “whys” provide a clear vision as to the why as well as illuminate what success will look like. Can you fit the business into your life? Building your business will take an investment of your time, and you won’t always be able to dictate when you will have to work and what tasks will take the longest. My very first client was just three weeks out from an extended trip abroad when she contacted me. I may have envisioned a slow and methodical process but that wasn’t what the circumstances dictated. There is also the extraordinary amount of time required to just keep a business running. Preparing and sending invoices, tracking inventory, meeting with clients, networking with others in your niche, etc., can consume a lot of time. You may be able to outsource a few of these tasks at some point but if you are trying to keep your start-up costs low, all of these tasks will be your responsibility in the beginning. Do you have enough money to float the business for the first year or two of operation? Your start-up costs will vary depending on the type of side hustle you launch. It may not end up being a lot but it is hard to imagine a business with zero start-up costs. Possible expense categories include: business cards and letterhead; a website; supplies; business equipment; advertising; postage and a P.O. Box; insurance; legal and banking fees; and professional dues. How much are you able to invest? Will you need to take out a business loan? I don’t have first-hand experience with those but I know there are options out there. If you are in the United States, the Small Business Administration could be a good place to start. The local office near me offers counseling and classes in addition to loans. When I started my side hustle, I budgeted for an investment of around $4,000 total for years 1 and 2 and I am so glad I did. I had hoped to have at least eight clients during the first year but ended the year with just five. And, because I offered discounts to all of them, my earnings that year didn’t even cover my fixed expenses let alone my time. I learned a ton, though, and in my second year I met my client goal of twelve and found it a lot easier to charge what I was worth (which means my earnings covered my costs and my time). I’ve read some places that crafting a business plan is optional but I got a lot of benefit from developing one and would encourage you to develop one too (in addition, your bank may ask to see your plan before allowing you to open an account). It was hard to force myself to address all of these topics—security for example—but later on, something would come up and it was amazingly helpful to have my business policies already spelled out. Pricing turned out to be one of the hardest things to focus on. I actually ended up taking a picture of my pricing list because I couldn’t remember what I charged and wanted to make sure I was consistent in the prices I quoted. What Side-Hustle Do You Want to Launch? Is one of your goals for creating additional income streams? What steps are you taking to turn that dream into reality? Let me know in the comment section below. Great advice here. I just started blogging and am considering turning it into a side hustle by selling ebooks and such. It can be hard wondering if I really want to invest in it. But then I think, what could it hurt, right? Thanks for posting! I know the struggle—I’m a newish blogger and it’s tough to know what’s the best thing to spend money on. I’m not monetizing yet but I have plans to do so in the next 8 months. In the mean time, I’m trying to be strategic. Good luck with your blog! Thank you–I am glad the post was useful.